Yes, you read that correctly. Mushroom goulash. If you hate mushrooms, don’t even bother reading any further (unless you are my sister… then you are MORALLY OBLIGATED to continue). I found this recipe in a book of wonder and joy called “Slow Cooker Favorites Made Healthy.” It called for portobello, but I used whatever those regular mushrooms are. “Button” mushrooms, maybe? It fed the two of us for 2-3 meals, if I remember correctly. I used smoky paprika, but next time I’ll probably use regular paprika. I am addicted to smoky paprika, but I think it was a little too smoky for this dish. 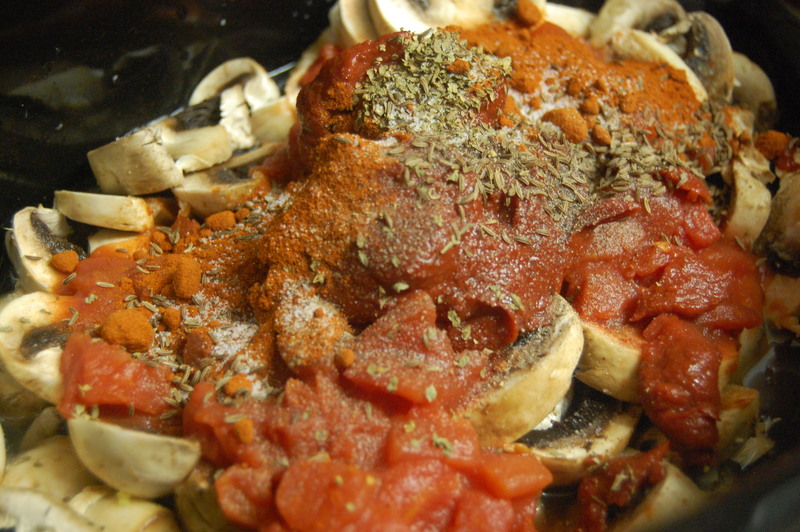 Combine the mushrooms, onion and garlic in the crock pot. Stir in the broth, undrained tomatoes, tomato paste, paprika, oregano, caraway seeds, salt and pepper (basically everything except the sour cream and noodles). Cover and cook on the “low” setting for 8-9 hours (or on “high” for 4-4 1/2 hours, according to the recipe). Stir the sour cream into the mushroom mixture before serving over noodles. I didn’t stop to take pictures of the finished product that morning before work. BUT, the above photo shows you how beautiful it is before stirring and cooking. I am a lover of mushrooms and my crock pot so might give this one a whirl.